Blackston is pleased to present Eve of Destruction, an exhibition of recent oil paintings by Pia Dehne. A reception for the artist will be held on Thursday, June 3rd from 6 to 8 p.m. In Eve of Destruction, Dehne continues her exploration of camouflage and mimicry as it exists in both man-made and naturally occurring contexts. 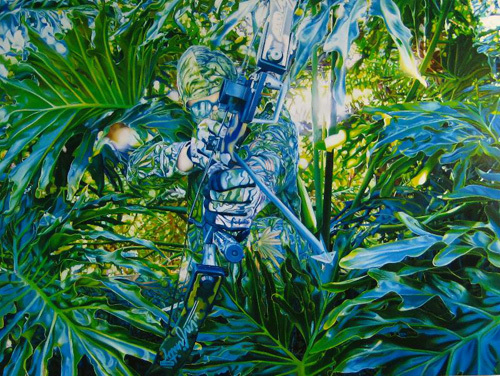 Dehne’s series of oil paintings portray camouflaged hunters in full regalia and several creatures — a dragonfly, turtle, frog — all barely discernible from their respective environments. The subjects, based on source material or the artist’s own photographs, are both hyper-realistic and abstract. Contours give way to deconstructed forms in a psychedelic panoply of painted depths and colors. Additional paintings in the exhibition depict military ships in various stages of contextual assimilation. The breakdown of the ships’ forms and their dissolution in the texture of the sea mirror Dehne’s study of the evolutionary space between figurative mimicry and abstraction. The show takes its name from the protest song, « Eve of Destruction », an anthem of Western counterculture in the mid to late sixties. The hints of psychedelic agency reference a predominant meme of the times. Psychedelic art and music were manifestations of the seemingly boundless but short-lived collective euphoria of a movement exuberantly empowered by mass rebellion and a liberated form of consciousness. Forty years later, the consciousness of the time still resonates. The element of hyper-realism in Dehne’s paintings is a nod to Jean Baudrillard’s concept of simulated reality: a condition engendered by man’s need to understand every aspect of life in an orderly, inorganic fashion. At their most effective, the mottled hues of protective coloration in the natural world achieve total abstract deconstruction. By means of illusion, camouflage brings about a level of optical synergy between man and nature. The irony of using artifice in this form of art to effectively assimilate with nature is not lost in Dehne’s paintings. Neither is the implicit menace of the hunters. Pia Dehne resides in New York City. She received her Master of Fine Arts from Düsseldorf Art Academy under Professor Markus Lüpertz. Dehne was born in Düsseldorf, later lived in Berlin and in 1999 moved to New York. The artist’s solo exhibitions include Country Life, Bespoke Gallery, NY, 2007; Bed Bad Beyond, Haswellediger & Co. Gallery, NY, 2005; Naked City, Deitch Projects, NY, 2004 and I’m so Happy I could die, Laura Mars Group, Berlin, Germany, 2002. Recent group exhibitions include For Your Eyes Only at De Markten, Brussels, Belgium, 2010, and Hunt & Chase at James Salomon Contemporary, East Hampton in 2010.